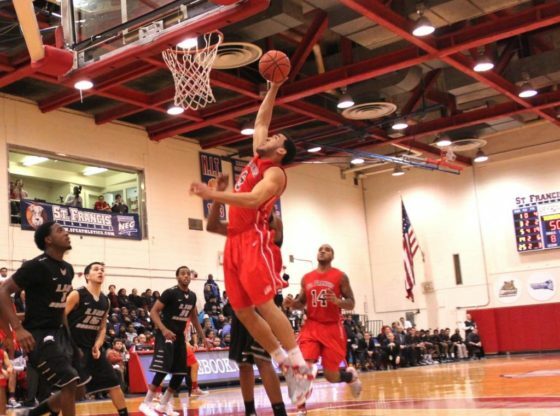 Basketball: The St. Francis Terriers take on the LIU Brooklyn Blackbirds, in the battle for Brooklyn tonight at 7pm. Tonight marks the Terriers first conference matchup and it comes against their bitter rivals the LIU Brooklyn Blackbirds. LIU has been a powerhouse in the NEC winning three consecutive NEC championships. LIU has totally dominated the Terriers defeating them seven times in a row dating back to the 2010-2011 season. This season has been different up until this point. The Terriers come into tonight’s matchup sitting in first place in the NEC with a 9-6 record. As for LIU it has been a rough go of it this season as they are 5-8 and have really missed forward Julian Boyd. Boyd has been the Blackbirds best player, but has had issues staying on the court throughout his entire career. He is out for the entire season with a torn right ACL. Without Boyd the Blackbirds have lacked that dynamic scorer that has put them over the top like they have had in previous years. The Terriers come into tonight’s game looking to right the ship after their brutal 20 defeat at the hands of Columbia. A win tonight would be a significant step in the right direction. If the Terriers can manage to knock off LIU, it will give them much needed momentum going forward. Every conference game proves to be a marquee matchup, but none can compare to the rivalry there is between these two teams. What to watch for is how the Terriers will come out of the gates and will they be able to set the tone of the game? They came out very lacksidasical in their last game vs Columbia. Their back were against the wall early as they fell behind 15-2. It’s very hard to play catch up especially against a team like LIU who has such a balanced scoring attack. Even without Boyd they have a total of five players who average in the double digits. The Terriers defense needs to be in full throttle tonight because if they allow Senior guard Jason Brickman to pick them apart it’ll be a very long night for the Terriers. Brickman comes in averaging a double double on the season. He is averaging 12.2 points and 10 assists, and has proved time and time again to be the Blackbirds floor general. The Terriers must make it a point of emphasis to shut him down. The Terriers need their stars to step up when the lights shine the brightest. Even though LIU comes in with a 5-8 record this is still a huge game for both teams. Junior forward Jalen Cannon must play like the star that he is tonight if the Terriers have any shot of winning this game. Cannon has been their guy all season long and tonight will be no different. The Blackbirds know Cannon is the Terriers prominent source of offense so they will try and make other guys beat them. Senior guard Ben Mockford need to exploit the three ball as he has done all season long. If Mockford can get going from three, that’ll open up the paint where Jalen Cannon can go to work. It would be nice to see Freshman forward Wayne Martin and Freshman guard Sheldon Hagigal step up this evening. Both guys have been held in check lately and have struggled shooting from the field after very nice starts to their careers. If they both can contribute a little bit of offense and take some pressure off of Cannon, that’ll mean the Terriers should be on their way to victory. This matchup will no doubt be one for the ages, as is every game between these two teams. If the Terriers can pull it out tonight it’ll put them right back on track as they look to improve their lead in the NEC.